Scofflaws are brawling in the streets of Deadwood. The railroad is being built, and to you and the other gangs in the badlands of South Dakota, this means one thing: cold, hard cash. As a cowboy on the wrong side of the law you know just how to take control of this shanty-town: threaten, fight, and kill off your rivals. Deadwood is a wild-and-wooly board game with a quick and deadly twist on classic worker placement games. Your gang consists of three different classes of cowboys with different strengths: greenhorns, gunslingers, and trail bosses. Cowboys ride into town to gain control of (annex) buildings and fight other gangs’ cowboys in shootouts. At the beginning of the game, the town of Deadwood consists of the Town Hall, the Church, the Sheriff’s Office, the Saloon, and four other randomly drawn buildings. Additional buildings are constructed whenever a cowboy annexes the Town Hall. Each building has at least one unique ability that is used immediately, with some buildings offering more long-term advantages. A cowboy accesses these advantages by controlling the building. To gain control a player simply places one of his gang on a building tile, “annexing” it. Other gang leaders can try to gain control of your buildings through shootouts. The player that instigates the shootout receives a Wanted Poster token; the more cowboys you try to kill off, the more Wanted Poster tokens you collect, and the higher the fine you must pay at the end of the game. 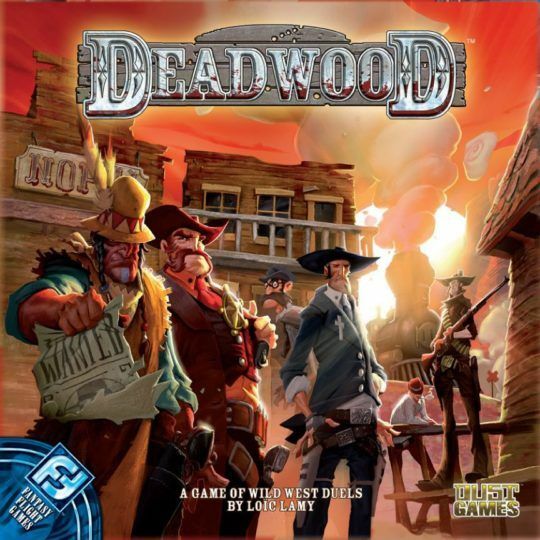 Deadwood can end one of three ways: the Train Station is placed on the board once the railroad is built and completed, there are no more Wanted Poster tokens in the Crime Pool, or any player has no more cowboys alive. The player with the most cash at the end of the game is the winner!